All information is brought to you courtesy of EMI. 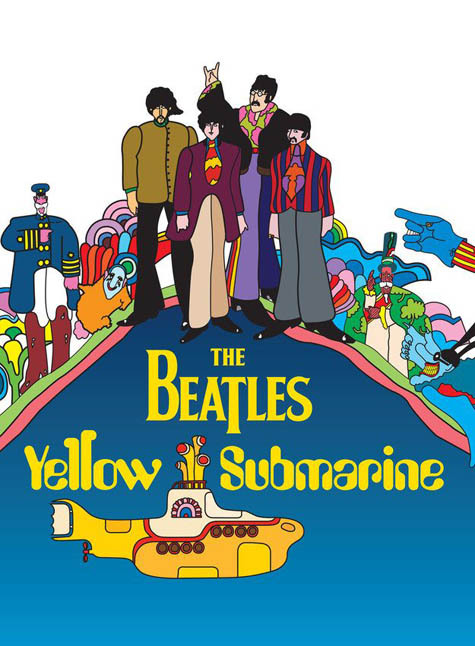 London – March 20, 2012 – The Beatles’ classic 1968 animated feature film, Yellow Submarine, has been digitally restored for DVD and Blu-ray release on May 28 (May 29 in North America). The film’s songtrack album will be reissued on CD on the same date. On April 24, Candlewick Press will release a new, compact hardcover edition of the Yellow Submarine picture book, a read-aloud journey for the whole family. Featuring the lighthearted wit of the film’s script alongside original artwork from the movie that has charmed children and adults through several generations, the beautiful, 40-page book will be sold by retailers everywhere and on the Beatles Store ( www.thebeatles.com). An interactive digital version of the book is also available as a free download on Apple's iBookstore for iPad, iPhone and iPod touch at www.iTunes.com/TheBeatles. Once upon a time… or maybe twice, there was an unearthly paradise called Pepperland, a place where happiness and music reigned supreme. But all that was threatened when the terrible Blue Meanies declared war and sent in their army led by a menacing Flying Glove to destroy all that was good. Enter John, Paul, George and Ringo to save the day! Armed with little more than their humor, songs, and of course, their yellow submarine, The Beatles tackle the rough seas ahead in an effort to bring down the evil forces of bluedom.